Assam Secretariat Admit Card 2017 - 2018 Download info for Computer Operator, Stenographer Grade-III & JAA Written Exam Admit card download. Assam Secretariat Admit Card 2017 - 2018 Download notification for Computer Operator, Stenographer Grade-III & JAA Written Exam Admit card download. Admit card download link available now check below to download your admit card Now (Updated on 30-01-2018). * The Written Examination will be held on 11-02-2018 (Sunday) in 15 Examination Zones as per above-mentioned advertisement. Duration of written examination will be of 2 hours from 11-00 A.M. to 01-00 P.M.
* The list of candidates who have been found eligible to sit for the Written Test will be uploaded in the website www.recruitmentaim.in Applicants are advised to go to the above-mentioned website and check the Written Examination venue in which they will have to appear. * All information/instructions to the candidates and the Admit Cards will be available on the above-mentioned website with effect from 05-02-2018. * Candidates should visit the above-mentioned website and download their individual Admit Card along with instructions. * The Examination Centre is mentioned in the Admit Card, No change of Examination center will be entertained. * All candidates are required to produce their Admit card in the examination center. Without Admit Card no candidate will be allowed to sit for the Written Examination. Qualification: Candidates shall be a Graduate in Arts, Science or Commerce from a University recognized by the State Government or a degree equivalent thereto and recognized by the Government. The candidates must also possess a minimum 6 months Diploma/ Certificate in Computer proficiency from a recognized Institute. * Full advertisement details about Assam Secretariat Recruitment. Candidates are hereby requested to visit the Govt. of Assam Secretariat official website www.recruitmentaim.in admit for downloading and printing of Assam Secretariat Admit Card. Now click on the Recruitment in Assam Secretariat (Janata Bhawan) Government of Assam, Dispur, Guwahati-781006 Click Here link. After that click on Click here to Download Computer Operator Admit Card. Now you will be redirected to a direct page of Admit download link. After that just click on 2nd link to Download Admit Card for the post of Computer Operator. Enter your registration no in the given box. That's it, download your admit and take a print out copy for attending the said exam. If you have forgotten your registration no than check below-given steps to regenerate your registration no. Now click on the Get Registration No for the post of Computer Operator. After that provide information on the given filed. Type your name in the Candidate name box. You have done it and your registration no will be appeared on the screen. Just copy or note down your registration not to download your admit card. Candidates who applied for the Post of Stenographer Grade III (English and Language) in the Assam Secretariat in response to the Government Advertisement Reference No.SAE.73/2016/97 dated 30.08.2017 are hereby informed to note the following. Check official notice. 1. The Written Examination will be held on 04.02.2018 in Guwahati. Duration of examination will be 2 hours from 11:00 A.M. to 01:00 P.M.
2. The list of candidates who have been found eligible to sit for the Written Test will be uploaded to the website www.recruitmentaim .in. Applicants are advised to go to the above-mentioned website and check the Written Examination venue in which they will have to appear. 3. All information/instructions to the candidates and the Admit Cards will be available on the above website from 24.01.2018. 5. The Examination Centre is mentioned on the Admit Card. No change of Examination Centre will be entertained. 6. All candidates are required to produce their Admit card in the examination center. Without Admit Card no candidate will be allowed to sit for the Written Examination. 7. No Mobile Phones, Calculators and any kind of communication devices will be allowed to carry inside the Examination Centre. 8. Eligibility of candidate is checked on the basis of the information provided in their Application Form. Being called for the Written Examination does not automatically render the candidate eligible for the post of Stenographer Grade III (English and Language). How can I download admit: Candidates are hereby requested to visit the Govt. of Assam Secretariat official website www.recruitmentaim.in admit for downloading and printing of Assam Secretariat Admit Card. After that click on Click here to Download Stenographer Admit Card. After that just click on 2nd link to Download Admit Card for the post of Junior Stenographer Grade-III. Now click on the Get Registration No for the post of Stenographer. Download Stenographer Grade-III Admit card. Important Notice: The name of the venue of Nowgong College, Nagaon has been wrongly printed through oversight as Nowgong Govt. College, Nagaon. Concerned candidates are informed to note it and they would appear in the written test in Nowgong College, Nagaon. 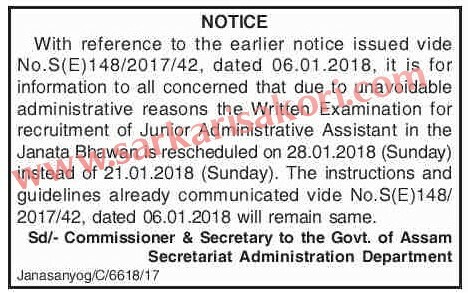 With reference to the earlier notice issued vide No.S(E)148/2017/42, dated 06.01.2018, it is for information to all concerned that due to unavoidable administrative reasons the Assam Secretariat Exam 2018 Admit Card Download for Written Examination for recruitment of Junior Administrative Assistant in the Janata Bhawan is rescheduled on 28.01.2018 (Sunday) instead of 21.01.2018 (Sunday). The instructions and guidelines already communicated vide No.S(E)148/2017/42, dated 06.01.2018 will remain same. Check official notification. 1. The Written Examination will be held on 21.01.2018 28.01.2018 in all the District Head Quarters of Assam. Duration of examination will be 3½ hours from 11.00 A.M. to 02.30 P.M.
2. The list of candidates who have been found eligible to sit for the Written Test will be uploaded to the website www.recruitmentaim.in. Applicants are advised to go to the above-mentioned website and check the Written Examination venue in which they will have to appear. 3. All information/instructions to the candidates and the Admit Cards will be available on the above website from 10.01.2018. 8. Eligibility of candidate is checked on the basis of the information provided in their Application Form. Being called for the Written Examination does not automatically render the candidate eligible for the post of Junior Administrative Assistant. 1. Junior Administrative Assistant = 174 Nos. How to download admit: Candidates are hereby requested to visit the Govt. of Assam Secretariat official website www.recruitmentaim.in for downloading and printing of Assam Secretariat Admit Card. Venue of the test: In Governor's Secretariat, Raj Bhavan, M.G. Road, Uzanbazart, Guwahati-1. Note: The Examination Centre is mentioned on the Admit Card. No change of Examination Centre will be entertained. 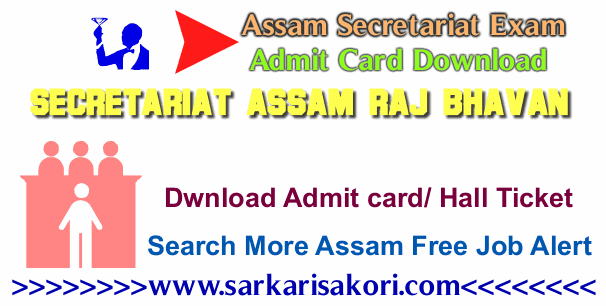 You will be interested more in Assam Secretariat Admit Card 2018 Download, www.sad.assam.gov.in admit card download.